A) Motorway exit Karlsruhe-Durlach (direction Durlach). B) after exiting keep right on B10. C) continue on B10 and after about 2.5 km take the first exit to the right, direction Ettlingen, Durlach (B3/Badener Strasse). D) on B3 turn left at fourth traffic lights into the Rittnertstrasse (direction Karlsruhe-Stupferich). 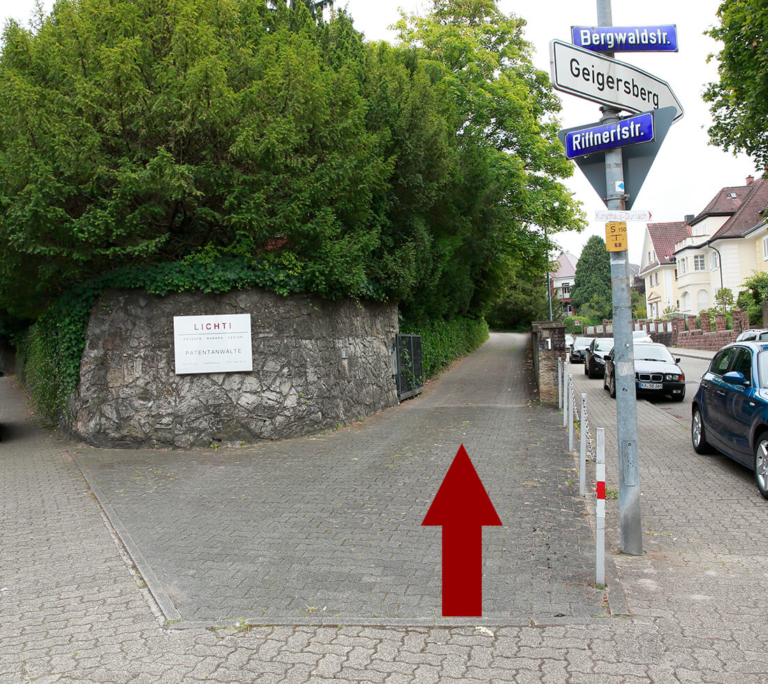 E) after about 150 m the road forks (half-left Rittnert-strasse – half-right Bergwaldstrasse), in the fork there is a courtyard followed by a drive (see photograph), travel up the drive and park in front of the building. 1) At the Karlsruhe motorway triangle direction Frankfurt. 2) Karlsruhe-Mitte motorway exit (direction Wolfartsweier). 3) after exiting straight ahead on the feeder road “Südtangente”. 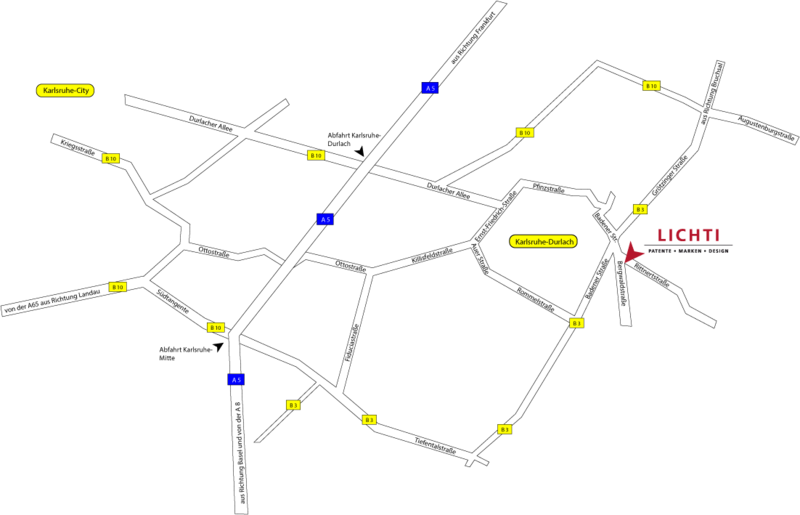 4) shortly after the road has been narrowed, you cross the tramway, then turn left at the traffic lights on B3, direction Durlach. 5) on the B3 turn right at the third traffic lights into the Rittnertstrasse (direction Karlsruhe-Stupferich). 6) after about 150 m the road forks (half-left Rittnerstrasse – half-right Bergwaldstrasse), in the fork there is a courtyard followed by a drive (see photograph), travel up the drive and park in front of the building. I) Cross the Rhine (feeder road “Südtangente”). II) straight ahead (pass the motorway access). III) then see above under 3). i) At B3 crossroads, turn onto B3 (direction Durlach). ii) then see above under D).